A full-featured, top-of-the line electric travel guitar. 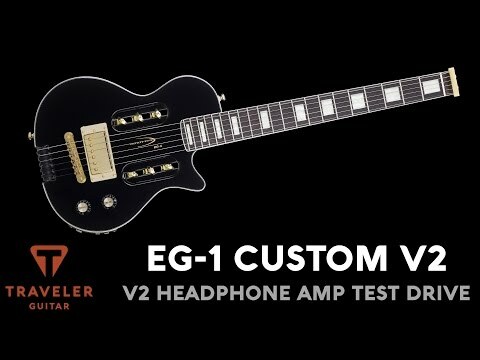 The Traveler Guitar EG-1 Custom (Black) is a full 24 ¾” scale electric travel guitar featuring our newly redesigned onboard V2 headphone amplifier. Plug in headphones or your favorite amp and cycle through clean, boost, overdrive and distortion tones using the custom tap-pot. In addition, the EG-1 Custom includes a built-in E-tuner and an aux-in jack so you can play along with your favorite tracks. Upgraded visual appointments include block inlays on its bound African mahogany neck, gold hardware, white-black-white binding on the black gloss alder body, gold humbucker with cream pickup ring and black dish knobs with gold caps. Deluxe Gig Bag included; fits in airline overhead compartments.Scale Length: 24 3/4 in. Neck Radius : 15.75 In. Neck Width At Nut : 1.63 In. Overall Length : 28.5 In. Overall Depth : 2.25 In. Body Thickness : 1.63 In. Body Width : 10.5 In. Weight : 4 Lbs. 13 Oz. Weight In Gig Bag : 6 Lbs. 10 Oz.